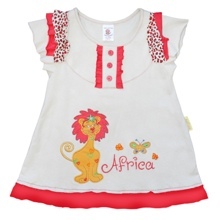 Plain beige swing top with capped sleeves is brightened up with bright red trim & stunning red leopard print detail. The sweet little girl lion is surrounded by embroidered embelishments. Matching leggings make this a gorgeous outfit.